Having a coffee allergy isn't a common occurrence. Everyone is different, however, and your immune system might just treat coffee like a harmful invader for some unknown reason. When this happens, every time you drink a cup of joe or even touch coffee grounds, you could experience an allergic reaction. Symptoms of various food allergies can all be similar, however, and problems aren't always associated with the coffee itself. Other components in coffee could be the real problem causers. Uncomfortable skin irritations can occur as soon as you touch coffee beans. Your skin can break out in hives and become red, irritated and possibly start itching. These skin problems could also happen around your mouth, after sipping coffee, or even pop up a little while after drinking your steamy cup of brew. Having a food allergy sometimes causes flulike symptoms. Issues might occur shortly after you finish drinking coffee, or hours afterward, as the potential allergen makes its way through your digestive tract. Nausea, vomiting, loose, watery stools and belly cramping are just some of the potential side effects of a coffee allergy. If you're allergic to coffee, you'll likely go through some coldlike symptoms as well. A runny nose or congestion is typical with food allergies. You might even start sneezing and have a dry cough. Depending on the severity of your allergy, your breathing tube might start swelling, causing wheezing. Without immediate medical treatment, breathing can become extremely difficult. Any swelling around your lips or throughout your tongue or throat after coming into contact with coffee signals that you need to seek emergency treatment right away. Having chest pain, a weak pulse and turning blue are just some of the things that can go wrong. You could also become very confused and even pass out, as your blood pressure drops and cells stop getting oxygen. These are warning signs of anaphylaxis, a potentially life-threatening condition. 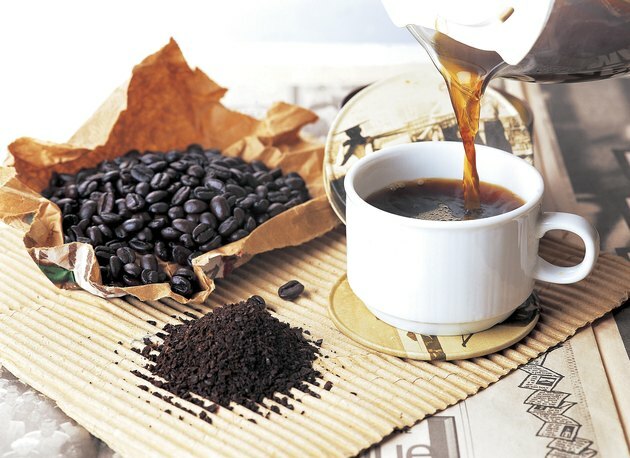 It might be the caffeine in coffee that's triggering symptoms, not necessarily the coffee itself. Caffeine is known to cause diarrhea, abnormal blood sugar levels, tremors, nausea and even vomiting. If you suspect caffeine is the culprit, switching to a decaf version of coffee could help alleviate problems. Any gastrointestinal issues could also stem from lactose, if you add dairy products to your coffee. Being lactose-intolerant means that your body doesn't have enough of the enzyme to break down lactose, so it may travel through your gut and cause bloating, nausea or diarrhea. Can Coffee Cause Gas and an Upset Stomach?